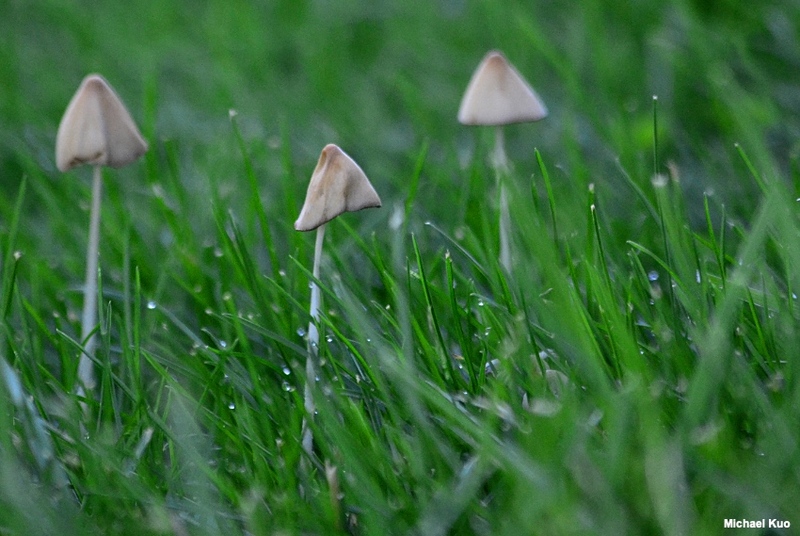 This little guy appears in lawns across North America, but is often overlooked. 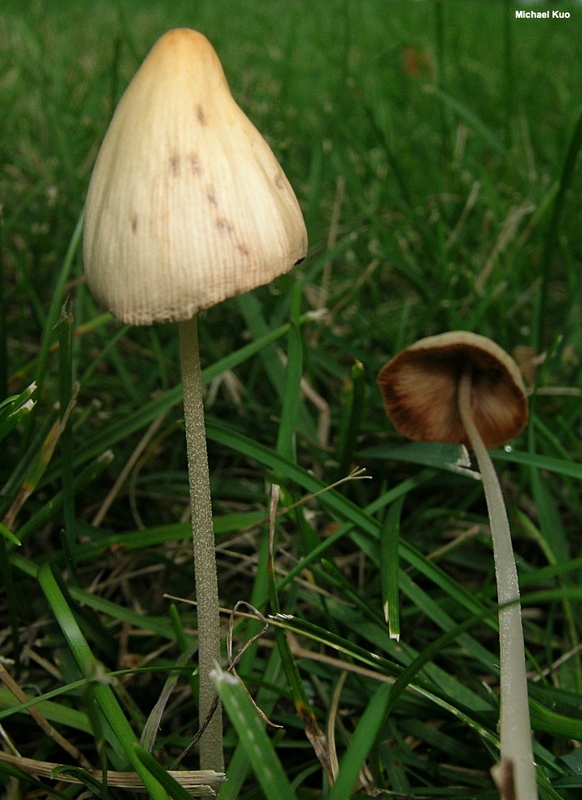 Not only is Conocybe apala small, but it is so fragile that it often collapses completely by mid-day, after having arisen a few hours before with the morning sun. 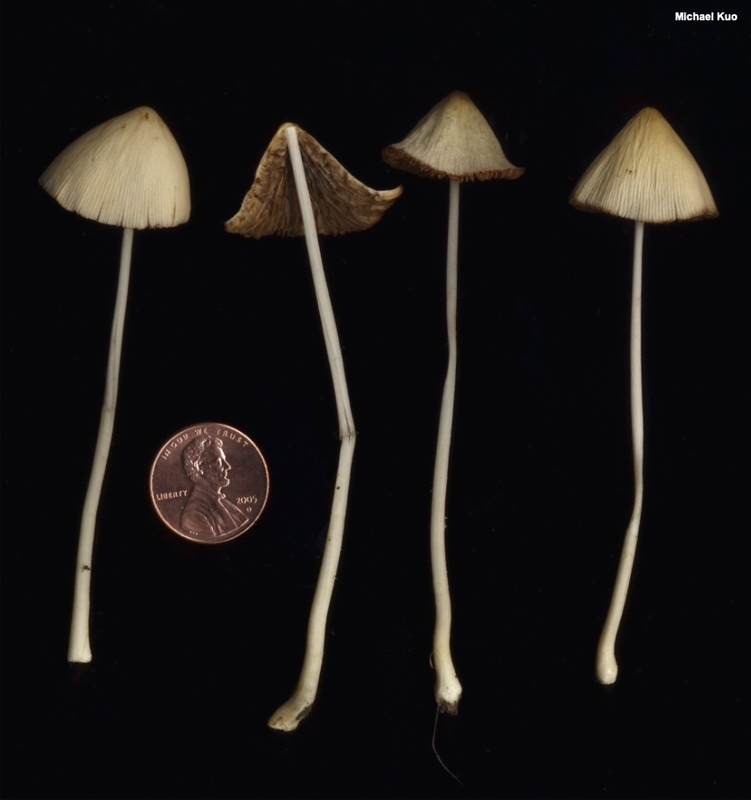 Distinguishing features include the pale, conical cap; the pale gills that are soon cinnamon brown; and the extremely fragile, skinny stem. 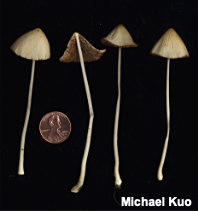 Some field guides refer to species of Conocybe as "cone heads," but anyone who watched Saturday Night Live in the early eighties knows that the true cone heads came from France. 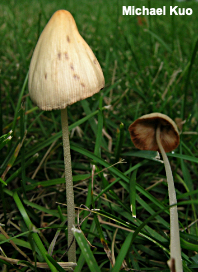 Conocybe lactea, Conocybe albipes, and Conocybe crispa are synonyms. 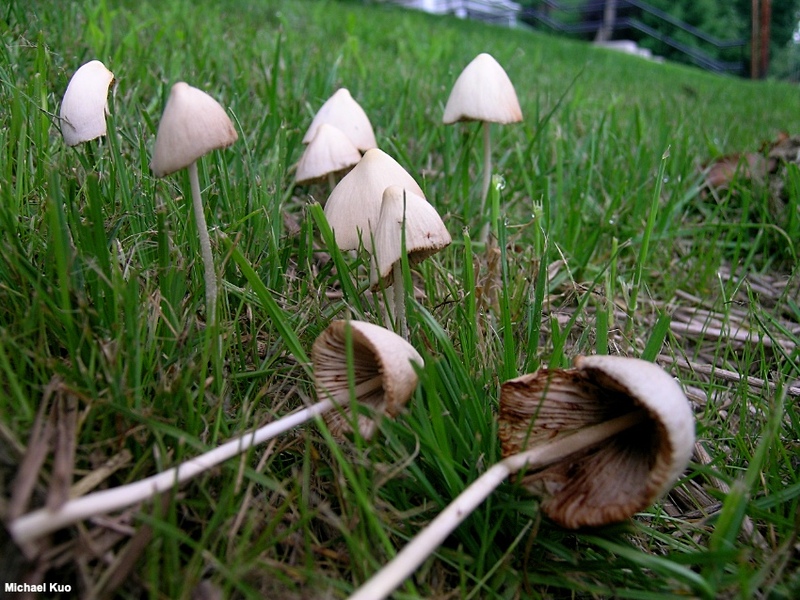 Ecology: Saprobic; growing scattered or gregariously in grassy areas (lawns, meadows, pastures, and so on); summer and fall (especially common in muggy weather); widely distributed in North America. The illustrated and described collections are from Illinois. Cap: 1.5–3 cm; conical when young, becoming broadly conical and droopy, sometimes with a bell-shaped center or an uplifted outer edge; dry; bald; becoming finely lined; whitish or creamy buff, sometimes with a slightly darker center. Gills: Narrowly attached to the stem; close or crowded; short-gills present; pale at first but soon cinnamon brown; often dissolving in hot, humid weather. 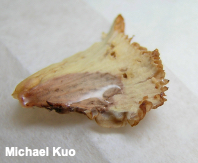 Stem: 7–10 cm long; 1–2 mm thick; extremely fragile; hollow; more or less equal above a slight basal swelling; whitish to faintly yellowish, especially near the base; bald or, on the upper portion, with scattered tiny hairs. Chemical Reactions: KOH gray to lilac gray on cap surface. 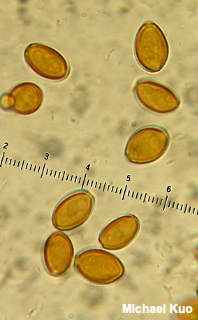 Microscopic Features: Spores 10–13 x 6–8 µm; ellipsoid, with a large pore; smooth; walls 0.5–1 µm thick; orangish brown in KOH; orangish in Melzer's. Basidia 4-sterigmate. Brachybasidioles present. Pleurocystidia not found. 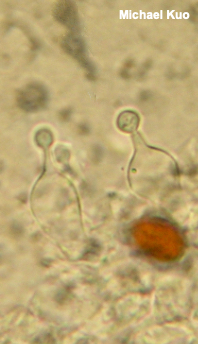 Cheilocystidia 20–28 x 7–14 µm; lecythiform with a subglobose head 3–4 µm wide, a narrow (2 µm) neck, and an obclavate bottom portion; smooth; thin-walled; hyaline in KOH. 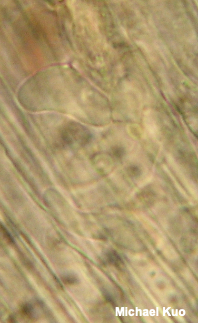 Pileipellis cellular; terminal elements 5–15 µm wide, subglobose, smooth, hyaline in KOH. Caulocystidia 10–20 x 5–10 µm; subcylindric to subglobose or somewhat irregular; catenuated; thin-walled; hyaline in KOH. REFERENCES: (Fries, 1818) Arnolds, 2003. (Smith, Smith & Weber, 1979; Watling, 1982; Weber & Smith, 1985; Arora, 1986; Phillips, 1991/2005; Lincoff, 1992; Metzler & Metzler, 1992; Breitenbach & Kränzlin, 1995; Barron, 1999; Arnolds, 2003; Hallen at al., 2003; Roody, 2003; Arnolds, 2005; Miller & Miller, 2006; Kuo & Methven, 2014; Desjardin, Wood & Stevens, 2015; Evenson, 2015; Siegel & Schwarz, 2016; Baroni, 2017; Hausknecht & Vesterholt, 2018; Sturgeon, 2018.) Herb. Kuo 07080802, 06220901, 06151502.